Foreword. Acknowledgements. Introduction. Electricity Inside Us. Heart Pulse. Crocodile Tears and Other Liquids. Inhale Deeper. Hunt for Cells in an Electric Field. How Nature Listens. Bone. Optics of the Eye. Magnetic Sense. Optima for Animals: from Mouse to Elephant. References. Index. 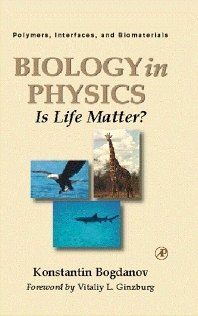 Biology in Physics is a radical new book which bridges the gap between biology and physics. The aim is to promote an interdisciplinary exchange of scientific information and ideas, in order to stimulate cooperation in research. The scope of this volume explores both the concepts and techniques of biophysics and illustrates the latest advances in our understanding of many of the specific mechanisms that are used by living organisms. This volume represents a special effort to bring together the information that would allow a nonbiologically oriented physicist to appreciate the important role that physics plays in life sciences. Physicists working in the areas adjacent to biology; researchers, graduate students, and practitioners--in applied physics, materials science, and applied chemistry. "Gives a relatively simple, nonsense introduction to topics of interest in general biology to which introductory physics can be applied. Topics include properties of nerve and bone, of the vascular system, kidneys and lungs, and of eyes and ears . . . manipulation of cells with electric fields and navigation by electric of magnetic fields. For most topics, the early history is mentioned, and reference is made to recent work." --Howard C. Berg, Harvard University, PHYSICS TODAY, September 2000.